Thanksgiving has always been my mom's favorite end-of-the-year holiday. There are no expensive presents to buy, no elaborate decorations to hang, and no children with ADHD and/or anxiety to try to get to sleep so Santa can show up. 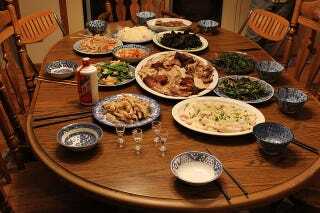 All there is to Thanksgiving is to cook a big meal, eat, do dishes, and then take it easy the rest of the day. I've always loved Thanksgiving for much the same reason. Sure, I grew to dread it as I got older and I was expected to help put up Christmas decorations—my grandma didn't mess around with either quality or quantity, and decorating often became a weekend project—but it was nice to have a Sunday afternoon in the middle of the week. As to be expected, I often spent the time playing games. Of course, since I had pretty much from late afternoon until Sunday night to play games (except for when I had to start putting up Christmas decorations, but I'm not bitter), I usually picked games that took up huge chunks of time. I was in it for the long haul, after all, so why not spend some time with a game that filled that time with memorable experiences? I would replay old favorites, maybe pick up a game on sale with my allowance the weekend before, or when Blockbuster was a thing, Mom would take me there the night before to rent a game. I haven't really changed much over the years. The thing I look forward most over the Thanksgiving holidays is having some time off to enjoy my hobbies, and gaming is my primary hobby. Even when I was being drafted into putting up the infernal, never-ending Christmas decorations, I still found time to game. You're probably planning on doing some gaming this weekend, or maybe you're going to have family over and you need something to entertain the young ones (or old ones). Here's a list of the top five games you should break out this Thanksgiving. With it now being available for all major platforms, there's really no reason why you shouldn't play Minecraft. Even if you haven't played it, you're probably familiar with it: stranded in a strange land and surrounded by natural resources, you have to survive by building structures, hunting and farming for food, building tools, and forging new materials. You can play in a high-risk mode where all manners of horrible creatures come out at night or in a more relaxed mode that allows you to unleash your creativity. It's not a game that boasts any kind of instant gratification; it requires a certain amount of patience and discipline, easy to obtain when you're stuffed full of comfort food and wearing your favorite pair of slippers. A great game for a lazy afternoon and a dinner of leftovers, Minecraft should be on your Thanksgiving playlist. This game scares me. I have tried playing it, and I simply get overwhelmed by all the statistics and procedure and just sheer brilliance of it. I keep telling myself that I'm going to install a graphics mod so I at least won't burn my eyes with the ASCII art, but I also want to play the game in its more pure mode. Nevertheless, I have had this game on my HDD for about two years now, and I've logged maybe two hours of play time. So why is it a perfect game for Thanksgiving? Not only does it provide an escape from the family drama you may encounter—nothing like having a game take over your brain, parasite-like, to forget your worries—but it also is analogous to the story of the First Thanksgiving! A brave band of stalwart explorers going out to make a better life for themselves, living off the land, making peace with the natives—okay, so maybe the dwarves don't make peace with the natives, but they can sure throw a fine feast! There's a chill in the air and night comes early, quiet and full of the unknown. Skeletal trees reach up into the starry night sky, illuminated by the white-blue glow of a full moon which is occasionally eclipsed by wispy gray clouds. Halloween may have been a month ago, but this is the real scary part of the year. What better way to settle in for a chilly evening than a quality Gothic horror experience? One of my favorite games ever made, I go back to it from time to time, and it always feels like a new experience. If you've never played it before, I envy you. This is a fantastic game to discover, and while you've got the free time and the atmosphere is right, you may as well pour a glass of mulled wine and plunge the depths of Dracula's castle. You've got the family over, possibly with way more kids than any rational person should have to endure. With any luck, those kids will be as much into football as their dads and will sit down for the endless spectacle of grown men getting paid millions of dollars to play a schoolyard game with each other on national television. More than likely, unfortunately, they'll want to play video games with you, the cool uncle (or brother, or cousin, or friend, or whatever title earned you the "privilege" of playing host). What are you to do? If you own a functioning post-SNES Nintendo console, you probably own a copy of Super Smash Bros.. Go ahead and bust that bad boy out. I haven't played the newest Smash yet, because I chose poorly and did not get a Wii U, but I have played every one (except for the 3DS iteration) in the past and I can tell you that nothing offers up hours of entertainment for sugar-jacked kids and teens better than this frantic, colorful, and satisfying fighting game. You may even have some fun yourself, and if you're on kid duty for the weekend (should your guests overstay their welcome) you can use it to get out of doing Christmas decorations. Win! By the way, if anybody wants to buy me a Wii U and the newest Super Smash Bros. for Christmas, that would be fantastic. I love video games, but I have a special place in my heart for board games as well. Video games to me are largely a solitary experience. Titanfall, Team Fortress 2, and Guild Wars 2 are about the only multiplayer games I enjoy. However, the real-world, real-time, face-to-face social aspect makes tabletop gaming a truly enriching experience, and what better time to break out a board game than on Thanksgiving Day. Clear the table, gather everybody around, and celebrate your blessings by trying to save the world from an eldritch horror who lurks beyond the confines of time and space. Don't let the size of the board intimidate you—there are many, many components and lots of book-keeping in this game, but the rules are actually quite simple when you really get the flow of them. A full 8-player game can take 5 hours or more to chug through, win or lose. Considering that this game simply doesn't want you to win—it has an insane difficulty level and gives players few advantages—it might not seem like a fun-filled family friendly game, and truth-be-told it's not. But if you're having friends over, this is the perfect game to spend the afternoon playing, with occasional breaks to fix up a Dickens sandwich or pour a glass of egg nog. So there you have it, five great games to break out for the Thanksgiving holiday. While I now have in-laws to visit and my own family to drop in on, Thanksgiving isn't as easy a holiday as it used to be, but I do intend to find some quality time for gaming. I hope you do as well. And no, I'm not putting up any Christmas decorations.